Cat eye infections are more common than you might think. They’re often caused by a virus or bacteria, but there are many other causes as well. It’s important that you recognize the signs of a cat eye infection and take your furry friend to your veterinarian as soon as possible. Let’s explore the different eye infections that your feline may present with –– is it pink eye, dry eye, conjunctivitis, or something else? 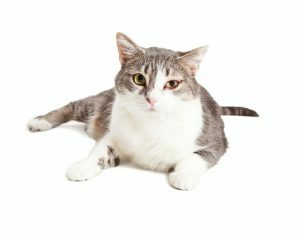 What Causes Eye Infections in Cats? Now, there are several different types of cat eye infections, some more serious than others. Cats can get conjunctivitis, or “pink eye,” just like humans. Conjunctivitis is an inflammation of the protective pink membrane called the conjunctiva which lines the eyelids. The primary job of the conjunctiva is to protect the eyes from debris. Conjunctivitis causes the eye to become inflamed, swollen, and red, and it is usually caused by viral or bacterial infections – most commonly viral infections known as calicivirus and herpesvirus. These infections can be further complicated by secondary bacterial infections. 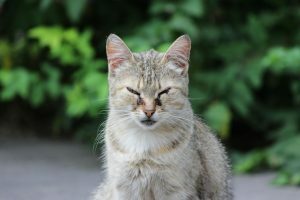 Pink eye can also be caused by scratches from other cats, fungus, chemicals, foreign bodies, and even cat shampoos that can upset the conjunctiva.1 The good news is, conjunctivitis in cats is easily and quickly treated by a veterinarian. Blepharitis is an infection that occurs on the eyelids. It causes inflammation of the skin and hair follicles of the outer eyelid, and the muscle, connective tissue, and glands of the middle layer of the lid. Blepharitis can cause your cat great discomfort. They may have discharge coming from their eyes, and you might also notice that your cat squints or blinks in spasms. You’ll probably also notice them trying to rub at their eyes, because blepharitis also causes itching. If you see your cat rubbing at their eyes, stop them. Doing so can cause even more eye problems, like ulcers. If your cat appears to have itchy eyes, always take them to a veterinarian. Keratitis is an inflammation of the cornea – the transparent layer that forms the front of the eye. This condition, if left untreated, can become a serious infection. Keratitis often presents as a cloudy or watery-looking eye. As it turns out, the herpes virus is a major trigger for keratitis in a cat’s eyes (known as nonulcerative keratitis). This problem can ruin a cat’s vision long-term. It’s thought that nonulcerative keratitis is caused by an immune system reaction, rather than by the herpes virus itself. Anterior uveitis is an infection of the uvea, the eye’s blood vessel layer, which includes the iris. It’s a very painful condition that can, in severe cases, lead to blindness in an infected cat. You may be well versed in styes, as they’re very common in humans. Whether human or feline, a stye can be red, swollen, and incredibly uncomfortable. What are the Symptoms of Feline Eye Infections? To rehydrate your cat’s eyes, your veterinarian may prescribe some special eye drops. When you take your cat to the veterinarian, they’ll closely examine the animal, asking you about symptoms you’ve observed. They may also check for signs of an upper respiratory infection, or cat flu. Why? Your veterinarian will also likely want to perform several tests. One popular eye test, known as a fluorescein stain, can help your vet identify ulcers, foreign objects, or any damage to the cat’s cornea. But it can also detect some viral and bacterial eye infections. First, an orange-colored dye is placed into your cat’s eye. Then, the veterinarian will use a blue light to look into the eye. Any issues will show up green, allowing your vet to determine the exact eye issue based on the location, the size, and the shape of the dye stain. 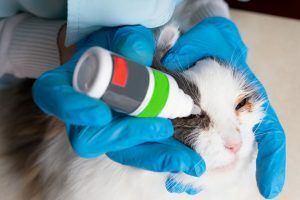 How does a Vet Treat Eye Infections in Cats? If you are going to have to administer topical treatments, your vet will show you how to do this with a wriggly, irritated cat. What is the Prognosis for Cat Eye Infections? If caught early, the prognosis for cat eye infections is usually good. Both bacterial and viral infections respond well to treatment. If the eye infection is a secondary symptom of a more serious condition, your vet will advise on the next best steps to take. How Can Eye Problems in Cats Be Prevented? Sometimes, cat eye problems can’t be prevented. That said, certain cat eye diseases can be prevented (at least somewhat). 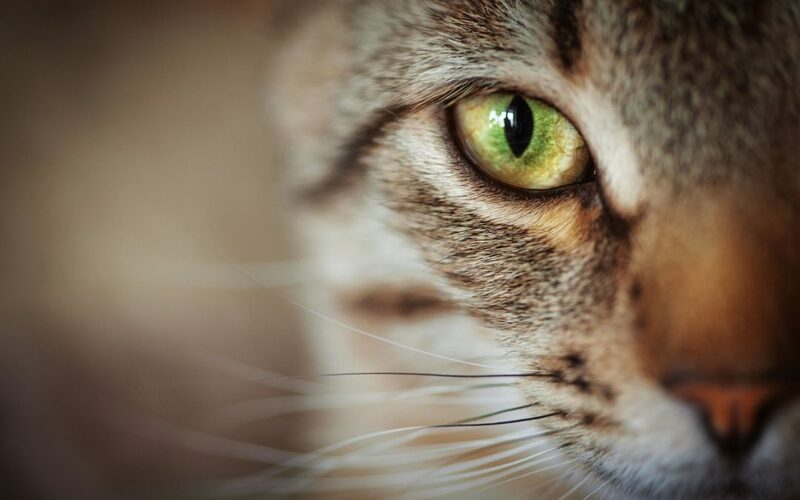 Be vigilant about your cat’s eye health. Get to know your cat’s eyes, so you’ll be able to tell quickly when something’s not right. Look into your cat’s eyes in a well-lit area. They should be clear and bright. The area around the eyeball should be white, and the pupils should be equal in size to each other. Gently peel back your feline’s eyelid (with clean hands!) and have a good look at the lining. It should be a healthy pink, not red nor white. Wipe away any gunk from your cat’s eyes with a damp cotton ball. Make sure to wipe away from the corner of the eye, and always use a fresh cotton ball for each eye. Take care to snip any long hairs that could agitate your cat’s eyes. 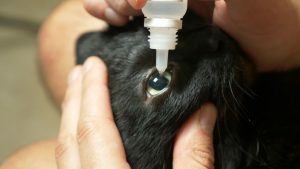 Don’t use eyewashes or drops unless your vet has specifically prescribed them. As humans, we know that if anything is wrong with our eyes, we should seek immediate medical assistance. Our eyes are fragile, and we don’t want to lose our vision. Well, the same goes for our furry companions! Eye infections are common in cats, and they can cause great damage if left untreated. And, your cat may make the infection much worse if they’re constantly trying to paw or scratch at it. Just as eye infections cause you pain and discomfort, the same is true for your cat. Prevention is always best, so get to know your cat’s eyes, and seek out your vet’s advice if you notice anything unusual.